We weren't expecting to like the Pixma MG7120 as much as we did, as we're predisposed against printers with high black ink costs. But the overall experience and print quality softened our stance. At $200 (as of 10/30/2013) it's about as good as you'll get in a photo-oriented MFP, but yes, we'd prefer pay a bit less per page for ink. The Pixma MG7120 has a beveled-edge design distinct to certain Canon printers of the last several years, and other design improvements that were introduced last year with its cousin, the Pixma MG6320. You control the printer using an upper front touch panel: A 3.5-inch touchscreen display contains most functions, with contextually lit buttons that show up as needed. It has a very short learning curve. You lift that panel to access the ink cartridges, instead of lifting up the entire scanner bed, as with most multifunctions. You can connect via Wi-Fi, Ethernet, or USB. Paper capacity is limited: 125 sheets of plain paper in the bottom cassette, and 20 sheets of 4-by-6-inch or 5-by-7-inch photo paper in the photo tray found directly above that. Flip over the photo tray, and you'll find the optical media tray, which inserts into a slot just above the output tray. The output tray itself is immediately above the paper trays and opens automatically when printing or copying. There's no automatic document feeder (ADF) for scanning or copying multi-page documents, which isn't unusual for a home-oriented printer, but we like it when we see it. The HP Photosmart 7520 is a like-priced competitor that has an ADF (and--ahem--cheaper ink). Next to the output tray, another front panel folds out to reveal three card slots: Secure Digital, Compact Flash, and Memory Stick. You may print via any of them as well as Wireless Pictbridge. The Pixma MG7120 comes with the usual array of remote printing features (email, Wi-Fi, though no NFC), and Canon has apps for both Android and iOS. The top-mounted scanner bed is A4/letter-sized with a lid that telescopes an inch or so to accommodate thicker materials. 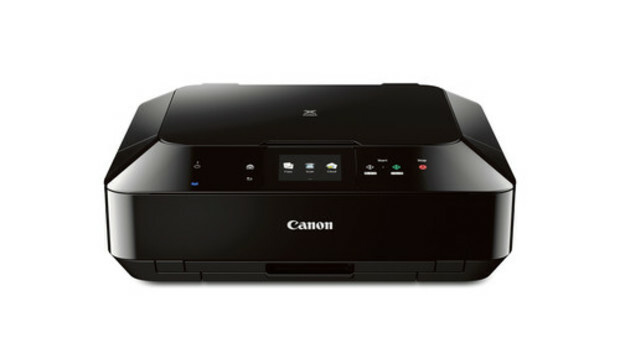 Canon's My Image Garden is the main software application used for scanning, editing, printing to optical discs, and keeping track of images, But the company also provides utilities for viewing images on the desktop and launching various features of the printer (scan, copy, edit, etc.) They're especially handy if you're dedicating an office PC for printer chores, limiting the amount of time you must spend hunting through the applications for the feature you need. For occasional use, they're probably overkill. To get the best results from the Pixma MG7120, you'll need to use good photo paper, which will always set you back a few dimes. But Canon could do better with the ink costs. The Pixma MG7120 uses a six-color system: black, pigment black, cyan, gray, magenta, and yellow. All are available in both standard and high-yield ('XL') capacities. In standard capacity, black pages cost about 5 cents, and four-color pages 16.6 cents. This is not counting the extra photo-black and photo-gray, which contribute miniscule amounts to a non-photo page. The XL-capacity cartridges are only slightly cheaper: 4.6 cents per page for black, and 12.7 cents for all four colors. If you print occasionally--tickets, web pages, and the like--then the MG7120 has decent costs. If you print lots of monochrome business documents, not so much. The quality of the Pixma MG7120's output is where it earns its keep. Photos are superb for a $200 photo printer, and the color palette is nicely balanced, neither overly warm or cold. Text is sharp, and there was nary a defect in large areas of black, which is where you'll usually spot any problems with a print system. No striations, no banding, no muddled edges. Good stuff here. Performance is better than average for a photo printer. Subjectively, we never felt like we were waiting an overly long time for output to arrive--especially when using draft mode, whose quality is good enough for most everyday applications (and will stretch your ink a lot further). By the numbers, the Pixma MG7120 printed text and mixed monochrome pages at an aggregate 8.6 pages per minute on the PC and 7.9 on the Mac. 4-inch by 6-inch photos printed at 2.7 per minute to plain paper and 1.7 per minute to glossy stock. A full 8.5-inch by 11-inch photo printed on the Mac took just over two minutes. Scans were decently fast, at just under a half-minute at 600 dpi and just under a minute at 1200 dpi. Copies arrived at a sprightly 5 pages per minute. The Canon Pixma MG7120 color inkjet multifunction delivers extremely nice photos, and text quality that's just this side of laser. It also automatically duplexes and has some of the easiest controls the company has produced to date. It's a printer well worth considering, even with its somewhat pricey inks.